Hey everyone, Luke and Jackson here, today we will be reviewing one of the largest movies of the year, Avengers: Infinity War. Infinity War came out on April 27, and instantly made waves in the community. Be warned, as this review will have spoilers from the movie that will honestly blow your mind if you have not seen it. Infinity War is the newest installment in the MCU and Part One of the Culmination of the Avengers storyline that we know of so far. 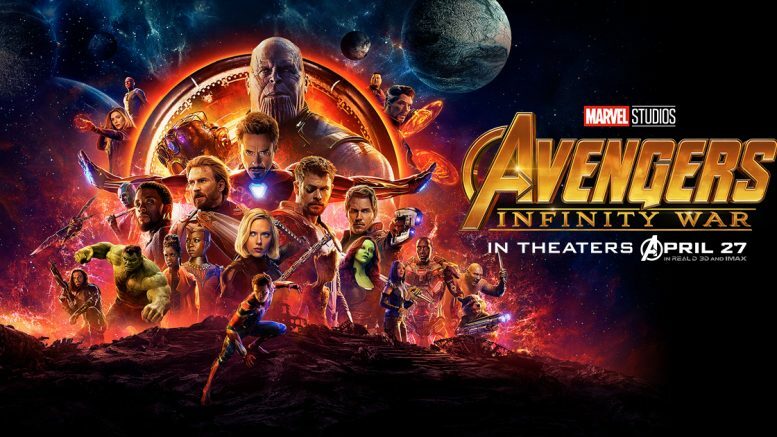 Naturally, a movie like Infinity War broke records, most notably the title for largest opening weekend in film history, making a foreign and domestic total of $630+ million dollars. The budget for the movie was $300-400 million dollars, meaning Marvel made back their expenses twofold in just one weekend. The movie starts off with the main villain, Thanos, capturing Thor, along with Loki, Heimdall, and the other members of the starship we see at the end of Thor: Ragnarok. As Thanos offers to spare Thor’s life for the Tesseract, also known as the Space Stone, Bruce Banner (Hulk) suddenly appears and attacks Thanos. However, Banner is quickly defeated by Thanos, causing Heimdall to send him back to Earth as a distress signal. As Heimdall is killed, Loki tries to trick Thanos and attempts to stab him, but is stopped by Thanos by use of the Space Stone. Loki is then killed, as Thanos and his minions, the Black Order, teleport away, leaving Thor alone. Banner crash-lands in the Sanctum Sanctorum in New York and explains the events to Stephen Strange (Doctor Strange) and Wong. As the sorcerers go to Tony Stark (Iron Man) for help, New York is suddenly invaded by a large spaceship. As two of the Black Order, Ebony Maw and Cull Obsidian engage battle with Strange, Wong, Stark, and Banner, Peter Parker (Spider-Man) sees the ship and goes to investigate. Interestingly, Banner is unable to transform into the Hulk. This forces Wong to send Banner to alert the Avengers, while Wong himself stays behind to guard the Sanctum. While Maw captures Strange, trying to get the Time Stone, Stark and Parker are able to rescue him on Maw’s ship, killing Maw in the process. Meanwhile, in Scotland, Vision and Wanda Maximoff (Scarlet Witch) talk about removing Vision’s Mind Stone to prevent Thanos from taking it. They are attacked by the other members of the Black Order, Corvus Glaive and Proxima Midnight. While they show some fight, they end up being saved by Steve Rogers (previously Captain America), Sam Wilson (Falcon), and Natasha Romanoff (Black Widow), then the members of the Black Order retreat. The five heroes then go back to Avengers HQ, meeting up James Rhodes (War Machine) and Banner, as we learn that Clint Barton (Hawkeye) and Scott Lang (Ant-man) are under house-arrest for the events of Captain America: Civil War. The Avengers talk about possibly separating the Mind Stone from Vision’s forehead. Then Rogers suggests going to Wakanda for the removal, where they can possibly keep the Ultron and J.A.R.V.I.S. programs, allowing Vision to still live. As the Guardians of the Galaxy fly through space, they meet Thor, who tells them about Thanos. The Guardians decide to split up: Thor, Rocket Racoon, and Groot will go to Nidavellir, in order to get a new weapon for the Asgardian god, while Peter Quill (Star-Lord), Gamora, Mantis, and Drax will go to Knowhere to retrieve the Reality Stone from the Collector. At Nidavellir, Thor reunites with Eitri, who helps them create the enchanted axe, Stormbreaker. Meanwhile, the other Guardians challenge Thanos for the Reality Stone, only to realize that Thanos already took it. Thanos captures Gamora during the process, and interrogates her of the Soul Stone’s whereabouts, which Gamora only answers when she realizes that her sister Nebula’s life is at stake. Thanos and Gamora travel to Vormir, where they meet none other than Johann Schmidt (Red Skull), the villain from Captain America: The First Avenger, who tells Thanos that he has to sacrifice something that he loves in order to get the Soul Stone. As Gamora taunts Thanos on the account that he loves nothing, Thanos reluctantly shoves Gamora off the cliff, killing her, and revealing that he does in fact have some degree of love for his adoptive daughter. Nebula quickly escapes Thanos’ ship, and contacts Quill’s group to meet her on Titan. The Guardians go there to find Stark, Strange, and Parker, who came from Maw’s spaceship. After a brief skirmish, the two groups learn that they are in fact on the same side. The group sets up a trap for Thanos, who comes for Stange’s Time Stone. The plan works, and Stark and Parker nearly succeed in pulling off Thanos’ gauntlet, when Thanos, under Mantis’ powers, reveals that he killed Gamora. Enraged, Quill attacks Thanos, breaking Mantis’ focus and allowing Thanos to overpower them. Strange eventually gives up the Time Stone in exchange for Stark’s life, as Thanos leaves, in search of the final stone, the Mind Stone. At Wakanda, the group of Avengers meets King T’Challa (Black Panther) and Roger’s old friend Bucky Barnes (Winter Soldier/White Wolf). T’Challa’s sister Shuri starts to seperate the Mind Stone, but she says that it will take time. Suddenly, Cull Obsidian, Corvus Glaive, and Proxima Midnight attack, along with Thanos’ army. The Avengers, T’Challa, M’Baku, Okoye, and the Wakandan warriors prepare to make a final stand at Wakanda by letting down the protective barriers in order to give Shuri more time. Banner, still unable to become Hulk, ends up using Stark’s Hulkbuster armor in the fight. While they start off well, Shuri is unable to finish the process before the army breaks in, and the Avengers find themselves quickly outnumbered. Suddenly, Rocket, Groot, and Thor arrive, with Thor’s new Stormbreaker axe. Obsidian, Midnight, and Glaive are soon respectively defeated by Banner, Maximoff, and Vision, who, after being interrupted in the separation process, still has the Mind Stone. The Avengers are gaining the upper hand when Thanos arrives, searching for the Mind Stone. Vision pleads for Maximoff to remove the stone, therefore killing him, saying that it is the only way to stop Thanos. Maximoff realizes that if Thanos gets it, there will be no way to defeat him, and reluctantly agrees to kill her lover. She does so, but Thanos uses the Time Stone to bring back Vision and kill him himself, gaining the final Infinity Stone. He is unable to be stopped by any of the Avengers when Thor attacks him, burying Stormbreaker into Thanos’ chest. Thanos simply says, “You should have gone for the head,” as his gauntlet begins to glow. 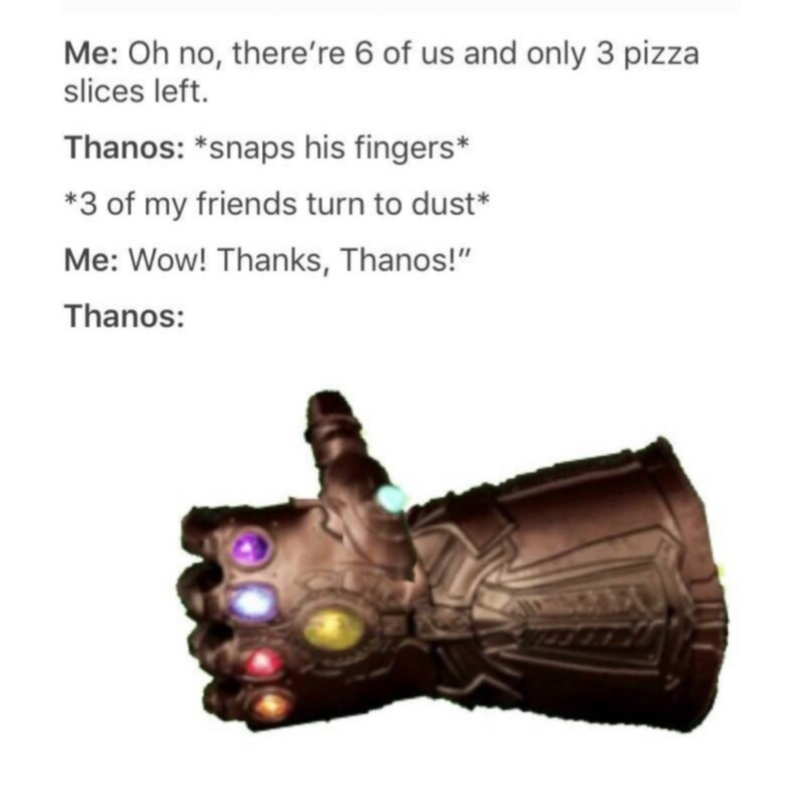 He then snaps his fingers. Suddenly, we are taken back to a blank scene, where we see Thanos and a young Gamora. Thanos smiles, saying that he reached his goal, but the young Gamora replies, “but at what cost.” We cut back to Wakanda where we see Thanos vanish. Suddenly, Barnes approaches Rogers, saying that he doesn’t feel well, before abruptly disappearing. On Wakanda, Maximoff, T’Challa, Wilson, Groot, and many soldiers disintegrate as well, leaving only Rogers, Thor, Banner, Romanoff, Rhodes, Rocket, M’Baku, and Okoye, as well as some other warriors. Back on Titan, Quill, Mantis, Drax and Strange vanish too, leaving Parker, Nebula, and Stark. Parker then says he doesn’t feel well either, crying about how he doesn’t want to die. He then disappears in Stark’s arms. In the post-credits scene, we see Nick Fury and Maria Hill driving through the city. They see a empty car that was previously moving, and then Hill starts to disintegrate. Fury also finds himself disappearing, and starts to make a phone call. However, he is unable to do anything before he disappears, dropping the phone on the ground. As the camera zooms in, we see the phone with the logo of Captain Marvel before we cut to black. Stark debuts his new Mark L armor this movie, featuring a Wakandan-esque technology that allows Stark to suit up using nanobots stored in his chest. In addition, Spider-Man gets to use the Iron Spider Armor, the suit that he previously declined at the end of Spider-Man: Homecoming. One of its most important features is its spider-like limbs that can project out of its back. Spider-Man also becomes a fully-fledged Avenger. Banner finds problems turning into the Hulk after the first scene, and instead uses Stark’s Hulkbuster armor in the climactic battle. After losing his shield in Captain America: Civil War, Rogers also changes his battle style, using vibranium gauntlets, the weapon associated with his alter-ego, Nomad, in the comics. Thor also powers-up, gaining the Stormbreaker axe after his old hammer, Mjølnir, was previously destroyed by Hela in Ragnarok. We also see Groot in his teenage years, which was seen in the post-credits scene in Guardians of the Galaxy: Vol. 2. Honestly, Avengers: Infinity War did a perfect job of bringing all the Avengers back together after the split in Captain America: Civil War, as well as grouping them up with the new characters such as Doctor Strange and the Guardians. Personally, I think that the pairing of Thor, Rocket, and Groot was perfect, but Iron Man, Spider-Man, and Doctor Strange also made a good group. This may sound weird, but the way that they brought previously unrelated characters together, then split and joined multiple groups reminds me a lot of the story mode in the video game Super Smash Bros. Brawl, which grouped up famous Nintendo characters in a similar fashion. This sets up the stage perfectly for Part Two, which is set to release in 2019. All the acting was great, as always, and the humor was perfectly Marvel-esque. A lot of the deceased characters are from the early movies in Phase One, those that had built up relationships with the main characters but are mostly forgotten. Out of all this information, the most surprising was that Dr. Jane Foster, a mortal doctor who learned of Thor’s past in Thor and Thor: The Dark World but hasn’t appeared in the MCU in five years, was marked as “spoiler”. Interestingly, there is a arc in the comics where Foster takes up the name of Thor, leading to some speculation about that happening in the movies. Additionally, we still don’t know the fates of some fairly important characters such as, off the top of my head, Hawkeye, Ant-Man, Wong, General Ross, Everett Ross, Phil Coulson, Hank Pym, Valkyrie, Pepper Potts, Kraglin, Baron Mordo, Helen Cho, Happy Hogan, and probably a lot more that I’m forgetting. Considering that the next movie in the MCU will be Ant-Man and The Wasp, a more comedic movie with less ties to the mainstream plotline, I’m curious about how they will explain the fates of these characters in The Wasp or in movies to come– the upcoming Captain Marvel, set to release in March 2019, seems like a good choice to show the fates of those who die at the end of Infinity War. Once again, all the acting was great, although I really want to give a shoutout to Tom Holland, whose performance as Spider-Man was amazing, especially at the very end. In addition, Chris Hemsworth, whose Thor performance skyrocketed after the ‘reboot’ in Taika Waititi’s Ragnarok, also seemed so much more natural and comfortable than he did before, thank to the newer, more lighthearted, and humorous role. Meanwhile, Elizabeth Olsen, whose role of Scarlet Witch was always more supportive since Avengers: Age of Ultron, also showed that she could play a deeper and more emotional part, as seen through her relationship with Vision. All the Guardians played well, and it was good seeing Zoe Saldana’s Gamora play a larger and more centric role, as well as seeing Dave Bautista’s Drax, who I always thought of as the acting-wise weak link, switch to a more humorous part, which fit him a lot better. Robert Downey Jr., Chris Evans, Chadwick Boseman, Benedict Cumberbatch, and Mark Ruffalo also played their respective roles of Iron Man, Steve Rogers, Black Panther, Doctor Strange, and Hulk very well, although at this point that was already expected from them. I also liked Tom Hiddleston’s Loki performance that, while short, gave Loki a lot more personality while still keeping it perfectly Loki-esque. Finally, I want to mention Josh Brolin, who played Thanos. I never gave his performance much thought before, but I thought that in Infinity War, we learned a lot more to Thanos, including that he’s not a downright cold and unloving person, as the Soul Stone scene reflects that. I think that Brolin did a superb job portraying him, and that he made the villain several times more likeable.